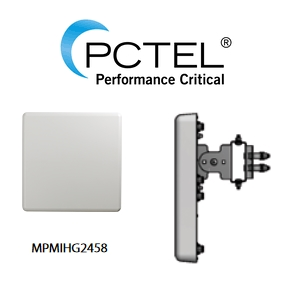 PCTEL has launched a new VenU high gain 802.11ac Wi-Fi panel antenna - MPMIHG2458. This dual-polarized, 4-port antenna provides dual-band 4x4 MIMO coverage for exceptional data throughput and reliability. Its high gain and compact, rugged housing make the latest VenU antenna ideal for outdoor enterprise Wi-Fi, Industrial IoT, transit, and rail applications. The new VenU antenna provides 12 dBi of gain. Each antenna port is designed to operate optimally within the frequency range of 2.4-2.5 GHz and 5.1-6 GHz for maximum data throughput. The antenna’s sealed IP67 and UV-stable housing provide reliability for long-lasting outdoor installations. A heavy-duty articulating mount is included for mast mounting. The VenU high gain 802.11ac Wi-Fi panel antenna is available now. Click here for more info.